That’s the ballot language codified by SR 287, one of two pieces of legislation that comprise Gov. Nathan Deal’s school takeover plan, which the State House passed on Wednesday, March 25, 2015. “Who’s against that?” asked State Rep. Carolyn Hughley (D-Columbus) in a floor speech opposing SR 287. “Does this question really convey to the people of the state of Georgia, who have entrusted us, what we are intending to do with the Opportunity School District? If my mother read this she would not know what we are talking about,” Rep. Hughley said. SR 287, which creates the referendum, came paired with SB 133, which outlines what the Opportunity School District (OSD) would actually do. As Atlanta Progressive News previously reported, the OSD would be run by a Governor-appointed superintendent, who would have the power to take control of “failing” schools and either operate them, hand them over to charter operators, share governance with the local board, or close them. This unelected official would have the power to fire and hire principals, faculty, and staff; and to control school finances, curriculum, and all other school operations. 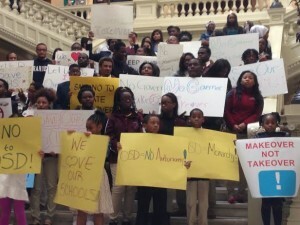 Dozens of teachers, parents, and students gathered at the Capitol to protest the legislation on Monday, March 23, 2015, hours before the House Committee on Education passed both the resolution and the bill. “Teachers take time out of their day to stay after school to tutor us in college preparation programs, to raise our scores, to put us in prestigious schools such as Bard and Brandeis,” Michelle Gutierrez, a senior at Towers High School in DeKalb County, told the crowd of supporters. “If you stop our progress now, if you take away the teachers that have built us up, you will be stopping all of our progress. You will be moving us back to square one,” Gutierrez said. Towers is on the Governor’s list of 139 “failing” schools that are eligible for takeover by the OSD. In the committee hearing that followed the press conference, State Rep. Christian Coomer (R-Cartersvile), who presented the bill, insisted that schools that show progress will not be prioritized for takeover. SB 133 stipulates the OSD can take over only twenty schools in the first year and can have no more than one hundred under its purview at any time. So the OSD would have to whittle down the list from the 139 schools that qualify. “We don’t want to intervene in a school that’s qualifying if its making progress in the right direction,” Rep. Coomer stated. Regardless of the intentions set forth in the bill, at the end of the day, the decision would rest with the Governor-appointed superintendent. Coomer also fielded concerns over whether SB 133 does an adequate job of precluding companies from taking advantage the OSD model in order to make a profit. While the legislation does state that OSD schools themselves must be non-profit, it doesn’t prevent them from contracting with a for-profit management company. “I think to say that a school could never contract with a for-profit entity would be a tying of the hands that would have unnecessary negative consequences,” Coomer said. He indicated that public schools already contract with plenty of for-profit companies to provide services from air conditioning to counseling. But it is more common for charter schools that are technically non-profits to contract with for-profit management companies like Edison Learning Inc., which secured an initial 17 million dollar contract with Atlanta’s first charter, Drew Charter School, in 2000. Edison opened its online Provost Academy in Georgia when the state Charter School Commission approved it in 2010. The next year, the Supreme Court of Georgia ruled that the commission was violating the state constitution in overruling local school boards to create new charter schools. In response, the General Assembly moved to strike down that pesky section of the constitution. Doing so required a ballot initiative (sound familiar? ), which Georgia voters approved in 2012 after an onslaught of campaign spending in support of the measure inundated the state. developer Tom Cousins contributed 20,000 dollars to the pro-amendment effort. Provost has since cut ties with Edison, which has found itself embroiled in numerous scandals over the years, and renamed its brick and mortar facilities from Magic Johnson Bridgescape Learning Centers ™ to Graduation Achievement Centers. Questions of profit aside, the most deliberated issue in the Education Committee’s meeting was that of the disconnect between the ballot language presented in SR 287 and the enabling legislation offered by SB 133. Rep. Coomer refused to yield on the language. When it came time to vote, the committee passed SR 287 with a twelve to six vote, and SB 133 passed thirteen to six. The Governor then reportedly scurried to secure enough votes to push both pieces of legislation through the House––the final stage before arriving at his desk for a signature. When the House took up the bill on Wednesday, Rep. Coomer tried to assuage those Republicans and Democrats alike who have framed the Opportunity School District as a prime example of government bureaucrats meddling in local affairs. He asked representatives to think of the OSD as a hand that doesn’t take power from the local school board; just to hold onto it. “The hand is taking that power so it can be pushed down to the local school. The parents, the teachers, and the principals in that local school will ultimately hold the power,” Rep. Coomer explained. Opponents and supporters of the bill debated for nearly two hours. Then State Rep. Stacey Abrams (D-Atlanta) delivered a minority report. “This is an incredibly broad distribution of power to a single person who none of us have met,” Rep. Abrams said. She lambasted the failure of SB 133 to clearly define what a “failing” school is, pointing out that the bill only says the OSD should use whatever rating system is in place at the time. Right now, the Georgia Department of Education uses a rating system called the College and Career Readiness Performance Index (CCRPI), or “crappy,” as one lawmaker referred to it during the debates. CCRPI is a new system that has undergone changes every year of its existence and has erroneously ranked schools as failing when they were not. CCRPI also relies heavily on standardized test scores, which are increasingly cast under a shadow of doubt as to whether they reflect a student’s learning or a school’s success. Rep. Abrams also focused on poverty and lack of education funding as the root obstacles to student achievement, as opposed to a problem of “culture” and “atmosphere,” as Rep. Coomer has argued. “I give Gov. Deal great credit. He has stopped the bleeding and is beginning to restore funding… but twelve years of deficits cannot be solved with two years of non-hemorrhaging,” Rep. Abrams said. SR 287, which needed 120 votes, passed with 121. SB 133 needed only 91 and received 108. So now the fate of the OSD will be up to those people lucky enough to have been successfully registered to vote in Georgia, which is another story entirely.